Inside DeAndre Ayton's journey from the Bahamas to the No. 1 prospect in the Class of 2017. CHARLOTTE, N.C. — DeAndre Ayton was crestfallen as he looked down at the large bag of ice taped to his right knee. A 7-foot, 230-pound center from the Bahamas, Ayton had come to the Under Armour All-American Camp at Queens University here in early July hoping to fortify his standing as one of the top high school players in America. However, midway through the second day, it was apparent that he could not play through the pain from a fractured kneecap he had sustained in February. That prompted Ayton and his high school coach, Zack Jones, to decide he would have to sit out not just the rest of the camp, but also the rest of the summer recruiting circuit. It was a huge disappointment. Ayton just completed his sophomore year at Balboa City School in San Diego, so casual fans do not know him as well as the senior-to-be supertrio of Harry Giles, Jayson Tatum and Josh Jackson—not to mention Thon Maker, the 7’1” wunderkind from Sudan who recently reclassified to 2016. 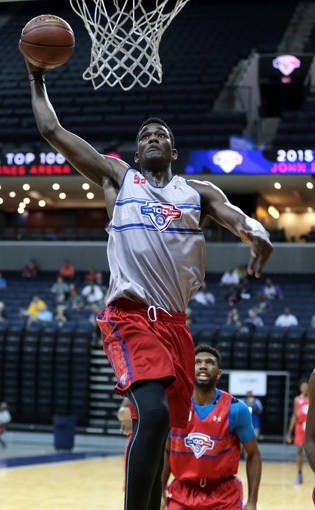 But many folks who track high school hoops are suggesting Ayton could be the best of the bunch. ESPN and Rivals.com rank Ayton as the No. 1 recruit in the Class of 2017. NBADraft.net lists him as the top pro prospect in high school, regardless of class. In February, Scout.com also ranked him as the best player in the country. Ayton’s game—his ability to attack the rim with power, combined with his exquisite handle and dependable jump shot—evokes comparisons to a young Kevin Garnett. And he just turned 17 on July 23. Ayton may only be approaching his potential, but he has already felt the whirlwind of forces that are unleashed when a teenage prodigy arrives from seemingly out of nowhere and plops directly into the seedy world of grassroots basketball. He has felt the painful tug from competing agendas amongst the grownups to whom his mother entrusted him. He has stood by as shoe companies lined up to curry his favor. He has seen his small private school in San Diego go from having no athletic program to one in which the basketball team plays a national schedule. Just five years ago, Ayton had scarcely even touched a basketball. Now the world spins on his fingers. The Jeff Rodgers camp, which has been in existence for nearly 30 years, features appearances by current and former NBA players, and it draws evaluators with all sorts of professional backgrounds. Those folks didn’t care whether Ayton knew the rules. They only cared that he was a 6’8” 12-year-old with preternatural agility and coordination. Among those impressed was an assistant coach for a professional team in Mexico. He put Ayton’s family in touch with his boss, Reggie Jordan, a former NBA player. Jordan referred the family to an AAU coach he knew in southern California named Shaun “Ice” Manning, who several years ago earned some notoriety in basketball circles when he mentored a young Jeremy Tyler, the 6’10” center from San Diego who, against Manning’s wishes, skipped his junior year of high school to play professionally in Israel. Manning had co-founded an AAU team called California Supreme and was coaching the San Diego Surf, an American Basketball Association team. In the weeks before he got the call from Jordan, Manning had been speaking with a wealthy philanthropist in San Diego named Ryan Stone about the possibility of together creating a local basketball program for elite prospects. When Manning told Stone about this young kid he heard about from the Bahamas, Stone told him to invite DeAndre and his mother, Andrea, to San Diego. When Ayton was in eighth grade, Manning brought him to AAU tournaments in Portland and Salt Lake City to compete with players his own age. “It was a joke,” Manning said. “He just dominated.” Ayton also turned heads in February 2013 at the Pangos Middle School All-American Camp in California. After a few days of displaying his incredible versatility—from throwing down a double-clutch reverse dunk to leading the fast break to sinking feathery baseline jumpers—Ayton was tapped by the website ballislife.com as the best eighth grader in the country. The secret was out. With Ayton in the fold, it became easier for Manning to recruit other elite players to Balboa. That led Stone to decide his program, which he named Force Sports Foundation, needed some veteran leadership. Manning recommended he hire Zack Jones, a former player at San Diego State whom Manning had coached against in the ABA. Jones had built athletic programs at two area schools, and he had been the head basketball coach for 17 years at Horizon High School in San Diego, where he coached future NBA players Jeff Withey and Jared Dudley. Jones was also the founder of a grassroots team called Supreme Court. Jones was hired at Balboa and given the title of executive director. From there, the situation got dicey. By the summer of 2013, following Ayton’s eighth-grade year, it became apparent that Jones and Manning had very different ideas about the direction that Force Sports, and Ayton, should take. The acrimony got so bad that Stone realized the two could not co-exist. Forced to make a choice, Stone decided to get rid of Manning. When Ayton's mother and stepfather came to visit that summer, Stone convinced them that DeAndre should move out of Manning’s house and live with a local family that was willing to host him. Manning, who was angry because he believed Jones had gone behind his back and slandered him, took the team to the Fab 48 tournament in Las Vegas in late July as originally planned. Upon hearing that Manning had gone to the tournament against his wishes, Stone sent a text message (which Manning showed to SI.com) threatening that unless he took everyone home “the authorities will be brought in.” Manning coached the team through the end of the tournament anyway. When he returned to San Diego, Manning recognized that Ayton’s mother had made up her mind. So he went home, washed Ayton’s clothes, brought them at 2 a.m. to the hotel where the family was staying, and said goodbye. By the end of Ayton's freshman year, he had drawn the attention of Nike, even though Balboa still did not have a basketball team. Last summer, Nike invited Ayton to be one of just five rising sophomores to participate in the LeBron James Skills Academy in Las Vegas. Jones did not notify Ayton of his invite until the day before, because he was worried Ayton would grow too anxious. Once again, Ayton performed superbly. He also played well later that summer in the Bahamas while competing for an exhibition team that faced American college teams. Ayton had 17 points and 13 rebounds in an 84-83 win over North Carolina, and he had 15 points and six rebounds in a loss to Ohio State. Last winter, Balboa City School, which was founded in 1991, staged its first-ever varsity basketball season. The school is not an official member of the California Interscholastic Federation (CIF), which means that Jones, who serves as the school’s head basketball coach as well as its executive director, is free to assemble a national schedule. Using a roster that included other international players from Canada, Germany, France and Venezuela (the international players have been placed with host families), Balboa played games in Mexico, Ohio, Nevada and Florida as well as California, finishing with a 16-14 record. Ayton averaged 21.1 points, 16 rebounds and 3.8 blocks until he hurt his knee in late February. ​Ayton’s college recruitment is only beginning to heat up. NCAA rules allow coaches to start calling recruits on July 1 before their junior season, but while a few college head coaches—including Kentucky’s John Calipari—reached out to him directly, Ayton is happy to have most of the communication go through Jones. Ayton does not have a Facebook page or Twitter account, although he has been advised to get an official Twitter feed so people wouldn’t be confused by parody accounts. Though there is no question Ayton is capable of becoming an elite college player, there is considerable skepticism among college coaches that he will be academically eligible. Because Balboa has never graduated a Division I athlete, it has yet to go through the process of getting courses approved by the NCAA’s eligibility center. A notice on the eligibility center’s website indicates that Baloba is under “an extended evaluation period to determine if it meets the academic requirements for NCAA cleared status.” Stone said he has been working with the NCAA to get the courses approved, and he expressed confidence that Ayton will be certified by the time he graduates.